Elegant, functional studio and equipped with all amenities, of 50 m2 and with independent access and garden of 200 m2. Video-surveillance car seat included. The apartment has a comfortable double bed with latex orthopedic mattress, kitchenette, private bathroom with shower box, walk-in wardrobe, fireplace, Wi-Fi, TV, air conditioning, mini bar. The large garden includes relaxation areas equipped with exterior armchairs, a sofa and a coffee table to enjoy the atmosphere served by citrus fruits and other fruit trees. It is possible to have breakfast in the outdoor areas. 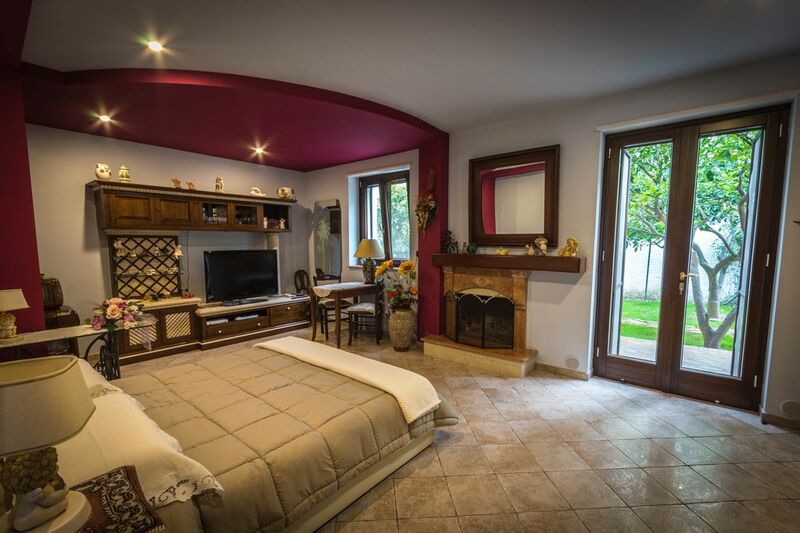 Located on the historic Via Appia, which connects Rome to Brindisi, as well as two steps from the Old Town, which overlooks a natural harbor considered among the most beautiful in the world. In the past, the area was used as a wine cellar and here lay the cisterns with the must, which would give birth to the excellent wines of the area. An oasis of tranquility within walking distance of the historic center in an area with all amenities. Just a stone's throw from the historic center and the brindisi movida, about 10 minutes walk from Brindisi Harbor. It is possible to walk to the train station via a newly built secondary entrance just a few minutes from the B & B. The location is strategic both to visit the old town and the major areas of interest of the brindisi without the use of private means of transport, as well as to reach the sea and the nearby cities by train, bus or taxi. All around the neighborhood there are banks, supermarkets, restaurants, tobaccos, gym, ovens, library and other services. Very clean and wonderful people who couldn't have helped you more. Good stay, location was a little bit away from the centre but accessible. Ho trascorso una bellissima settimana in questo monolocale "Comodissimo" e tranquillo, a rendere il tutto molto piacevole sono stati i padroni di casa, perché la loro cortesia e la loro disponibilità lasciano senza parole. Consiglio sentitamente di prenotare qui, non solo per avere un po' di quiete e tranquillità, ma sopratutto per chi ha voglia di visitare le varie località vicine molto note che meritano di essere esplorate e guardate almeno una volta nella vita perché sono splendidi luoghi con tanta storia da raccontare e scoprire, come Ostuni, Monopoli, Polignano a Mare che è la più distante e dista meno di 50 min di macchina tutto scorrimento veloce, per chi ama il mare ci sono le varie cale e torri che si affacciano sull'Adriatico a partire dalla Grotta della Poesia Rocca Vecchia, Torre dell'Orso fino ad arrivare a Torre Guaceto e dopo ancora Polignano a Mare con la cala della Paura.